Structured authoring is a publishing workflow that lets you define and enforce consistent organization of information in documents, whether printed or online. In traditional publishing, content rules are captured in a style guide and enforced by (human) editors, who read the information and verify that it conforms to the approved style. In structured authoring, a file—either a document type definition (DTD) or a schema—captures these content rules. Authors work in software that validates their documents; the software verifies that the documents they create conform to the rules in the definition file. Structured authoring and XML represent a significant paradigm shift in content creation. Implementing structured authoring with XML allows organizations to enforce content organization requirements. The addition of hierarchy and metadata to content improves reuse and content management. These benefits, however, must be weighed against the effort required to implement a structured authoring approach. 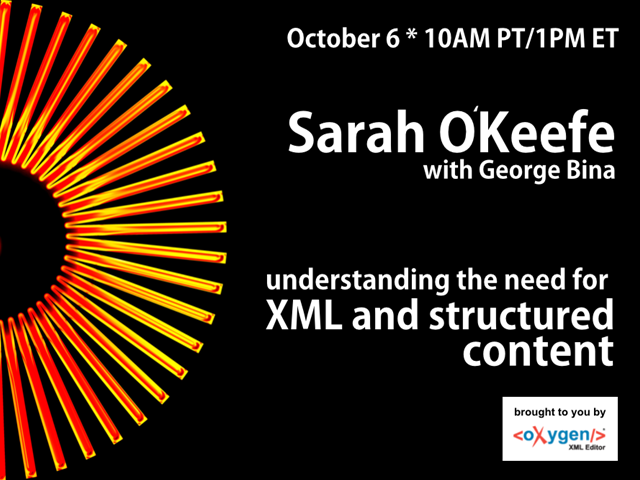 In this free, one-hour webinar, Scott Abel, The Content Wrangler, welcomes XML publishing expert, Sarah O’Keefe (Scriptorium Publishing), who will demystify structured XML authoring and explore the value of using XML to produce technical content. Sarah will be joined by George Bina of Oxygen XML who will be on hand to answer technical questions about the Oxygen XML Authoring tool. One lucky attendee will win a free pass to the Information Development World Conference, October 22-24 in San Jose, CA. And, ten registrants will be selected to receive a free copy of the book “The Language of Content Strategy” (2014, XML Press).